It was all my wife’s fault. She went out for some “girl’s thing”, so I definitely needed something to do for my Saturday as well. After a quick research in the Internet I decided to skip my plan of having the first race of this season in three weeks at Tegernsee and instead signed up for the long distance of Katzenbuckel MTB Marathon in the little village of Waldkatzenbach. So, I drove up to the Neckar-Odenwald region and hit the festival area around two hours ahead of the start. Enough time to get a good impression of what these guys are running there – and I really have to say they are doing a brilliant job. It’s a local “Radsportverein” setting up a whole day of races. In the morning there are kid’s and youngster’s races on an XC-course – and they had many participants! In the afternoon then there’s the marathon, for which you choose between a short and a long distance. Really good atmosphere there as well, and all of that for only 25 Euro which is a rather low price if you compare it to the big events of SOG and Co. So, at 1pm we lined up for the marathon. It was going to be four laps on a course, summing up to almost 70km and 1.450 hm (a bit more than it said in the internet before). And I really have to admit, I was nervous. Due to our stay abroad I started training only four weeks ago. And: This was not only going to be my first race for BWR, but also my first race on a Singlespeeder. Almost needless to say, that I was the only one, although there were many, many 29ers, especially in the pro teams. I was a bit skeptical about having to ride four laps, but it only took me half an hour into the race to be really convinced of this concept: This was one of the best, if not the best, course I ever raced on. There were incredibly many singletracks in the course, not just the alibi-like “Let’s-make-sure-everbody-can-stay-in-the-saddle-trails” you find at other events but those were really some of the “Jesus-Christ-this-is-why-I-do-mountain-biking-trails”. After all I have heard about racing in the States this course might come quite close. Lap one was fun and dusty, lap two a bit more flowy (and still fun) and a bit more dusty and I managed to enjoy the trails and keeping a bunch of shifters behind me. I have to admit that the last two laps were hurting, but hey, that’s part of the game. Breathing started to hurt after while (did I mention it was really, really dusty?) and somehow I got problems to get down food. I took a gel, walked some parts of the last lap and finished 42nd of 61 in 3 hours 48 min (lap times: 53 min, 53 min, 56 min, 1:05 h). 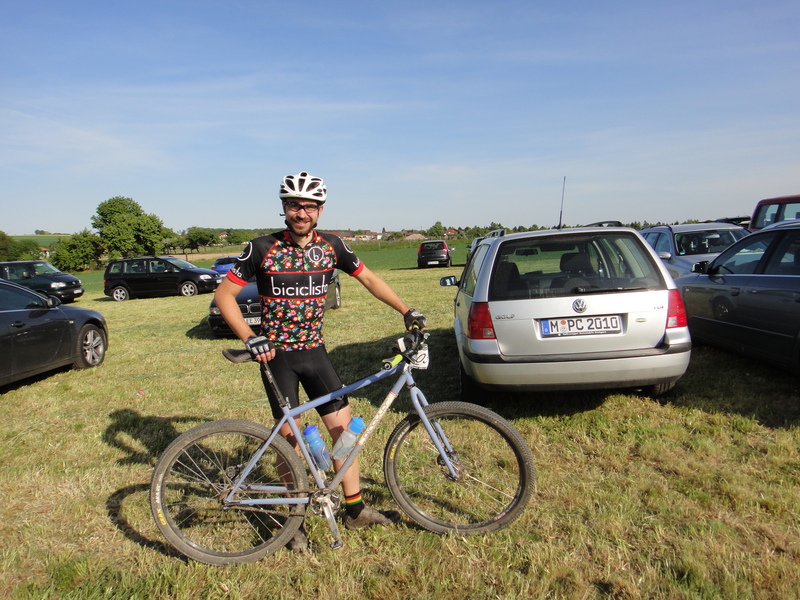 My first race on a singlespeed bike, finished and not coming in last – I was really enjoying my finisher beer and chatting with some other racers. The material was running brilliant and I had a good bunch of stuff with me that made me suffer a bit less: The Geax Aka tires (2,2”) did a perfect job, on the totally dry and (therefore) surprisingly slippy trails they offered me a lot of grip going uphill as well as in all the fast corners. There were many crashes in the race, but I always felt safe. The On One gearing was running without problems in all the dust. I had clothes from Biciclista and Sockguy and Specialized shoes, they made it quite the race as comfortable as you can have a race. I was riding a Singular Swift frameset with a rigid Singular fork that was provided by Jelle from Singlespeed.nl – I love the bike. Well, it’s the day after the race, I’m sitting outside on the balcony, having a coffee and typing this. God, I love this sport.